Docker Overlay Network is a good way to create isolate layer two networks where the containers are distributed on different physical hosts. It’s possible to define two equal subnets without any overlap because the network interfaces of containers are in different namespaces. The frame between hosts are tunneled by vxlan protocol that manages until to 16777216 vlan: much more of 4096 permitted by 802.1q protocol. In my laboratory I will create two overlay networks called red and green with the same subnet ip 10.65.10.0/24. Every network will have a different vxlan identifier: to all effects they are two different vlans. The hosts inside the two vlans can communicate only between them. All the containers can reach internet. The approach points the way witch openstack frameworks permits to different tenants the creation of different vlans even if belong to same subnet. In the laboratory four containers are created: namespace_01 and namespace_02 with one interface in red overlay network; namespace_03 and namespace_04 with one interface in green overlay network. Docker engine stores all the information about overlay network in a key-value store: in this case I have chosen consul daemon. The prerequisite of the article is to run a consul daemon and configure docker for using it: for that please read the section swarm docker cluster installation of my article. Let’s start how to create the two overlay networks and what happens inside linux network. Now two containers namespace_01 and namespace_03 are created belonging to network green using a very light linux container: busybox. Let’s to explain what happened behind the scene. On both dockers machine one network namespace is created. Every docker container is running inside it. For checking the namespaces, we should create the following links (it permits to use the command ‘ip netns‘). As you can see the namespace_01 container (the same for namespace_03) is inside a network namespace that isolates the container from the network of the docker system. The namespace_01 container contains two interfaces: the first, eth0, belongs to red overlay network (i will explain it later) and the other, eth1, configured for permitting to container to reach the external. First, let’s speak about the eth1 interface. This interface is a part of a veth pair of directly connected virtual interfaces: the traffic sent to one interface of the pair, it’s received in the other. It permits to the container or its network namespace to communicate with its default gateway that is a bridge network. In the image below is showed the network namespace configuration and how to match the pair veth interfaces. The default gateway of the container is the docker_bridge that by a source NAT forwards the packets to external world. The eth1 interface is the port to external world. Only the external word can be reached because other type of traffic are blocked by iptables rule. Let’s go now to explain the inside red overlay network. 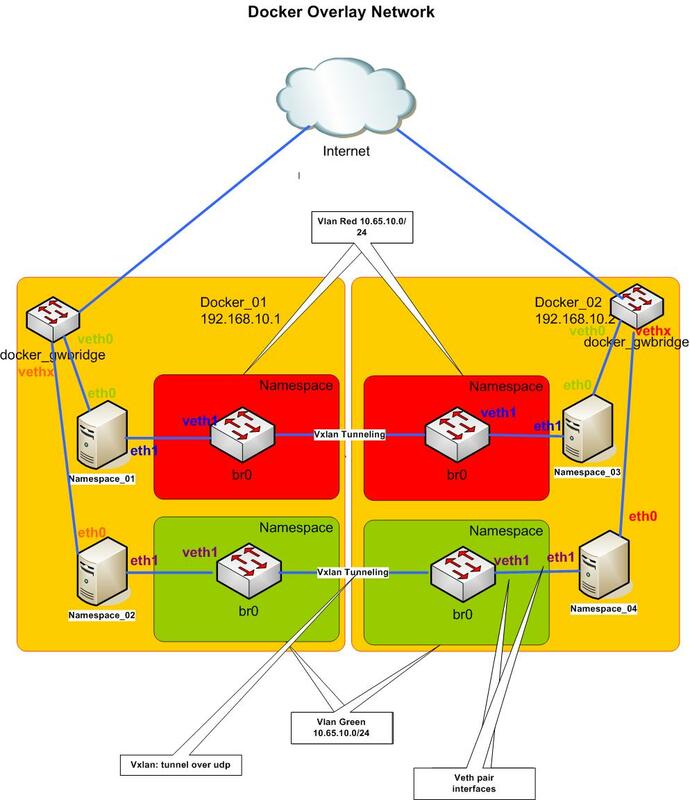 The red overlay network is a a layer two network spanned on both nodes by a vxlan tunnel. The eth0 interfaces of both containers (namespace_01 and namespace_03) belong to this network. Every interface is a part of another veth pair interfaces: the other side is inside an hidden network namespace. 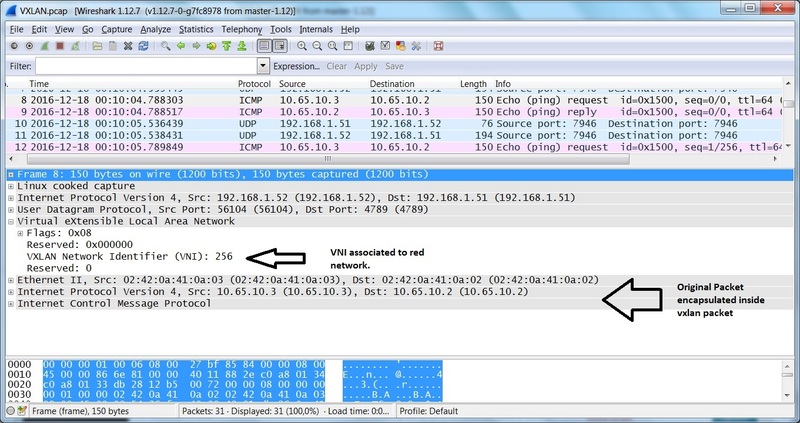 The frame of red network reach both hosts because they are encapsulated inside udp segment by vxlan protocol. Every vlan has a different vxlan virtual network identifier for avoiding overlap. Following the commands in order to check the red network configuration on the swarm-02 node (same thing for the swarm-01 node). The eth0 interface is part of veth pair interface: the other side is interconnected to veth interface (veth2) of a hidden namespace where is configured the vxlan tunnel. The docker daemon has created in the forwarding table of the hidden namespace (id 1-5eded2abc0) an association between the mac-address of other container of the vlan namespace_01 and the ip address of other docker system (192.168.1.51). Inside the docker container namespace_03 another association is created between the mac-address of other container of the vlan namespace_01 and its ip address. In this way no arp resolution is necessary for encapsulating the traffic on the vxlan tunnel. The ping from namespace_03 to namespace_01 works correctly. The icmp packet is sent to eth0 interface (no arp is needed), received from veth2 interface of hidden namespace, encapsulated in a udp packet and sent to other vxlan endpoint of the swarm-01 node. Now let’s go to create the green overlay network with the same subnet ip 10.65.10.0/24 and two other containers: namespace_02 on swarm-01 and namespace_04 on swarm-02. Now it’s possible to ping the container_02 from container_04. PING 10.65.10.5 (10.65.10.5) 56(84) bytes of data. PING 10.65.10.3 (10.65.10.3) 56(84) bytes of data. Let’s explain the role of consul daemon used to store all the information about the overlay network. 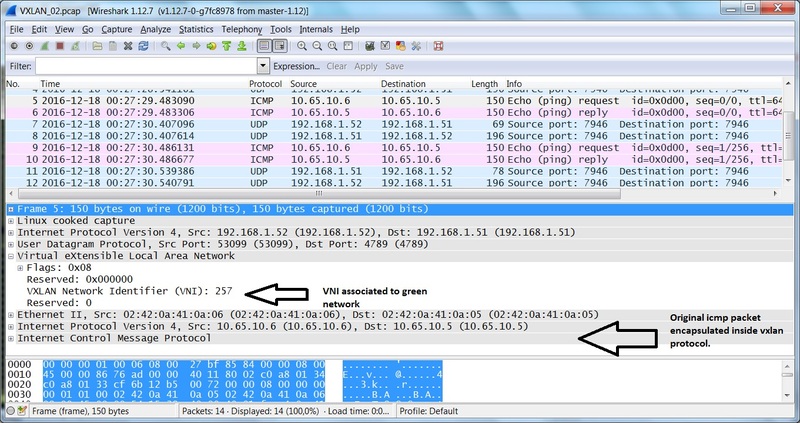 In this case the Vni is 256 (see the trace above). The consul daemon is the container that stores all the information about the overlay network and permit to docker daemon to configure in a right way the hidden namespaces where the vxlan tunnel is accessible. In this article I showed how to use docker for creating overlay network isolated from docker hosts by network namespaces. This approach permits to create secure environments well segmented and isolated that can only communicate with external world. The same result obtained by openstack with neutron for providing network as service to different tenants.